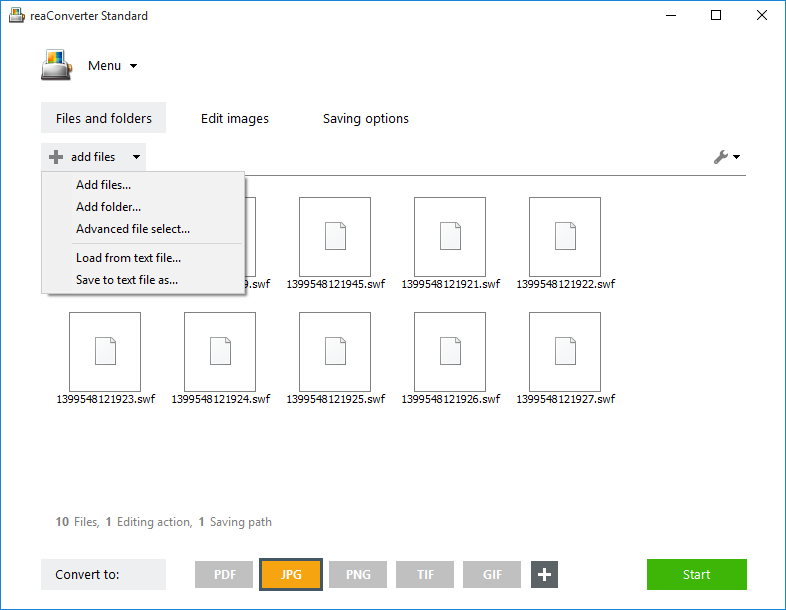 How to Convert SWF Files to Images? The SWF format is one that you’ll find commonly used for browser games, vector animations and other types of multimedia that imply video, sound and/or user interaction. Initially developed by Macromedia, SWFs are currently Adobe Flash files and their name is an acronym for ShockWave Flash or Small Web File. SWF files can contain a collection of images, including both vectors and bitmaps, as well as ActionScript content — a scripting language that facilitates user interaction. A SWF file can contain from few images to more than a hundred pictures with text, animation, and scripts in various combinations. For example, one page with text and several raster images inside it. 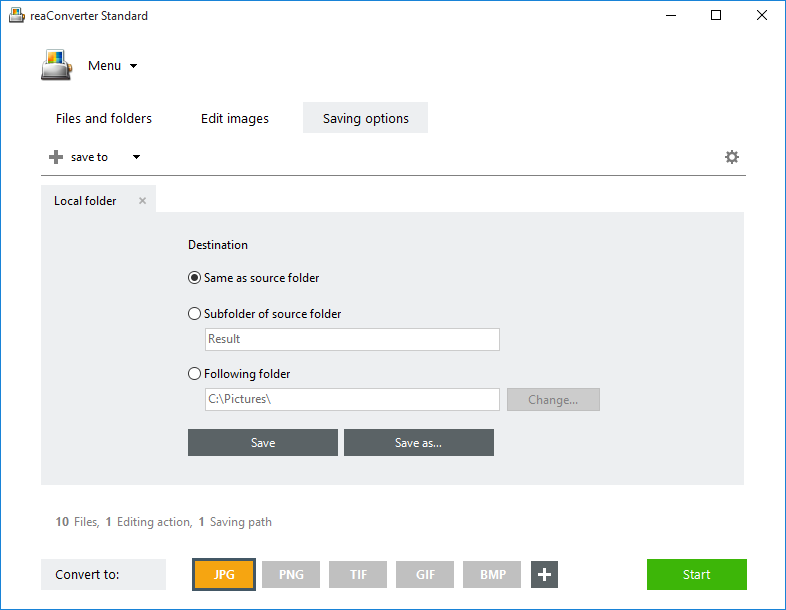 Extracting all raster images by converting a SWF file to one or more image files can be a tricky operation and requires using a software program that can process multi-page image files, such as reaConverter. Start reaConverter and load one or more SWF files into reaConverter by using the drag-and-drop tool or by browsing them manually from your hard drive. Go to the Menu button and click Saving settings → Additional saving settings and go to the Multipage tab. Here you can customize the way you want your images to be grouped after conversion from muti-page SWF. 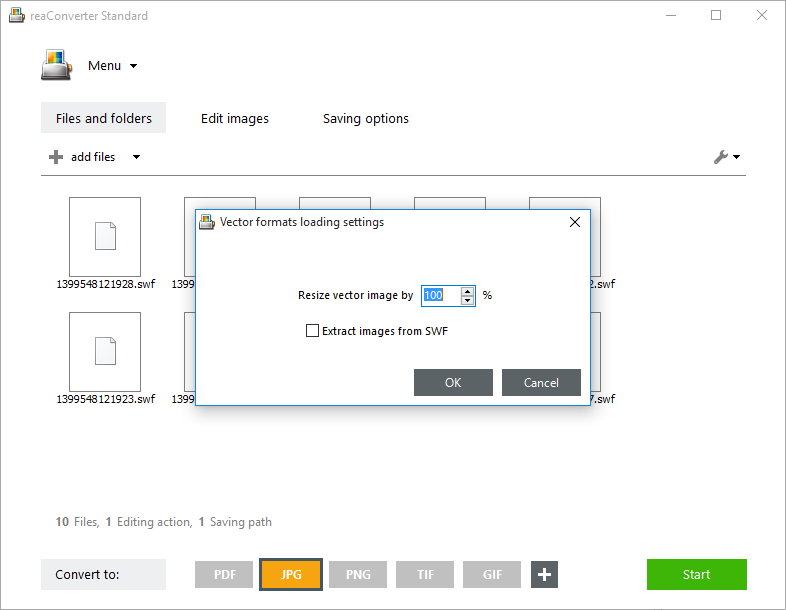 To extract raster images from vector images included in the SWF file, go to Loading settings → Vector format loading settings. In the newly opened window, click Extract images from SWF. Finally, go to Saving options and pick a location for your converted images, as well as their format — from the buttons conveniently placed in the lower part of the screen. 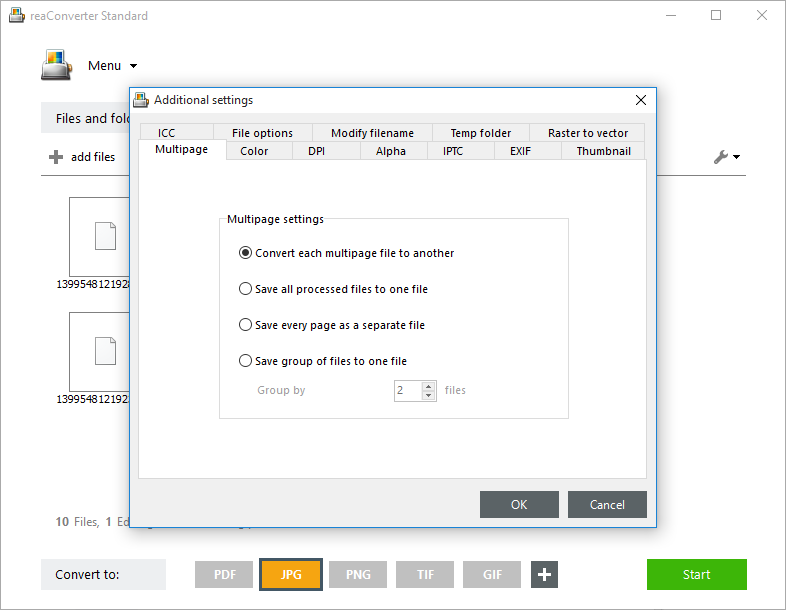 In case you choose a single page format, such as JPG, your output images can be stored separately from one another, but if you pick a multi-page one, such as PDF or TIF, all images included in the SWF file can be collected in a single output file. Also, if you pick GIF, the result will be a similar animation, but one that might be easier to handle than its Adobe Flash input version. After selecting the desired format, simply press Start and your new images will soon be ready! Advanced users can convert SWF files using command line interface or via DLL in manual, automated or scheduled mode. You are welcome to contact our technical support when you have any questions about reaConverter. This entry was posted in Document conversion, Vector conversion and tagged conversion, raster, swf on April 5, 2015 by reaconverter.